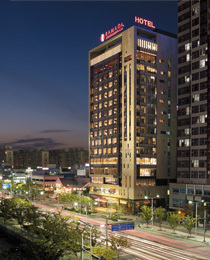 Ramada Plaza Gwangju promises an unforgettable experience at our hotel. It is a suite room exclusively for the most honored guests, where the past and the future are harmoniously joined together. The classical furniture radiating antiquity and the bathroom finished with the highest grade marble maximize the dignity of the guests staying in the room. 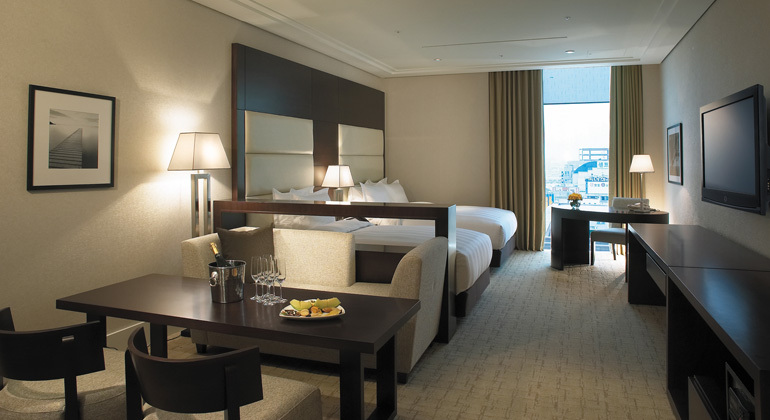 The strongest merit is the one-piece glass window widely cleared through which the night scene of gwangju can be seen at a glance and, the main bedroom and bathroom together with a small size space for an attendant enable you to enjoy the best service. It is the pride of gwangju for honorable VIPs. 100% cotton bath gown, hand/face/bath towels, indoor sleepers, cotton buds, cosmetic toilet cotton, comb, shower cap, shampoo, body wash, soap, lotion, hygiene envelop, sewing kit, hair dryer, bed cloth and pillow of down, private safe and desk, minibar, refrigerator, coffee maker, tea cup, telephone set, ball pen and pencil. The Internet service is provided in all guest rooms. Guests with a laptop can also enjoy the exclusive ultra-high speed Internet. [Internet Usage Fee] Free of charge. Please request an extra bed (for a charge) during reservation if needed.